One of the Southwest’s finest ensembles, the Klezmopolitans, began in 1984 as The Borderlands Klezmer Band. Our new name reflects the cosmopolitan nature of the music we play. We still specialize in klezmer and Jewish music, but we also play jazz standards, classical, Eastern European and gypsy music. 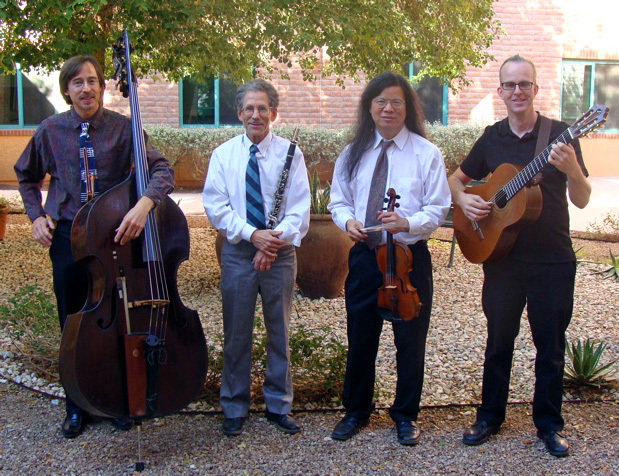 Made up of five of Tucson’s most experienced and versatile musicians, we play for weddings, bar/bat mitzvahs, parties, concerts and conventions. We were the band chosen to play at the 2000 Western Regional Judaic Studies Conference. They loved our klezmer music, but wanted to dance to the macarena, and we could play it! * Klezmer music is a unique blend of Jewish and Eastern European folk music. But you don’t need to be Jewish to appreciate Klezmer. Klezmer’s danceable rhythms and soulful melodies have delighted audiences around the world.